One down. All that's left is the squishy thief. 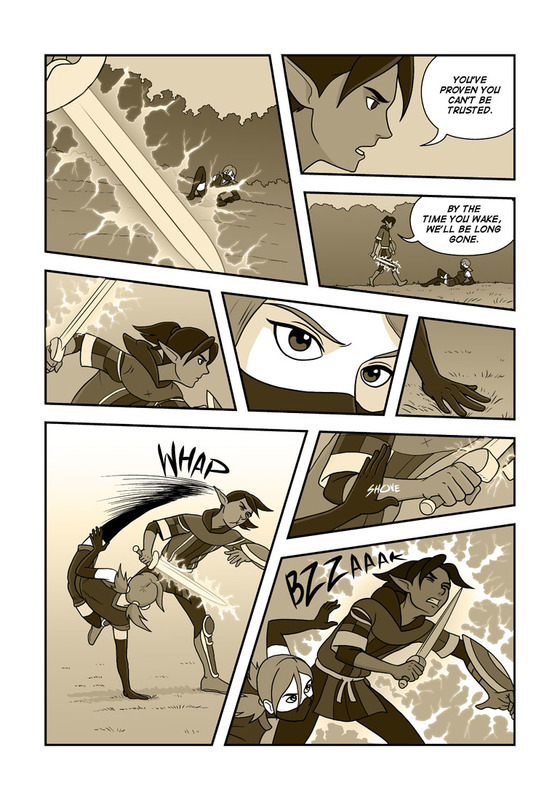 Very good use of the diagonal line for the panels to increase the sense of action and drama. Thanks. I try to have a bit of fun with the panels in action scenes. Maybe I get carried away sometimes. Another well-choreographed fight seen down to the smallest detail. For instance you had the girl shove the electrical blade at Auggie, and then you had her pull her hand away to avoid getting shocked. It’s kind of like watching an action movie, because of all the well place camera shots. The shading is also perfect, I just started adding shading to my own comic and it will take a while to master it as well as you have. Thanks as always for the feedback. I'm glad you noticed that fact about her hand. I was also worried that the shove didn't look strong enough like a push. I probably coulda done it better. As for the use of tones, I figured since the line art is very simple and lacking in detail, the greyscale needed to work a little harder. Hah yeah... Lets hope real good. Ooo, taken down by his own magic. How embarrassing. That really is. Epic fail. It's like he walked right into it. Hmm. Yes, but just untill he's unconcious. take this as a lesson Auggie, the cute ones are always the ones to keep an eye on. Thanks Darth. Glad you like how it turned out. Your battle scenes are WIN. I appreciate how you keep the personalities of the characters evident through their actions in battle. It's not just some "guy throws teh magicks, other guy swordzz" kinda deal. The character banter, movements, and decisions through the action keeps a good pace while continuing to show the distinct personalities. Bravo! Looking forward to more. This is the type of fantasy media I've been missing! Hey thanks so much for the encouraging words! I'm so glad you can enjoy it. As a comic artist I get mixed feelings about my own work sometimes. But what you mentioned is the one thing I do try my best on and am usually happy with. Glad you noticed it. Aug should have known that you don't do slow dramatic lines to a ninja! Auggie, ever stalwart in the face of adversity. Or... perfect, depending on which side you're on. Auggie may be down... But never count him out. Hey! No fair. Bzaat isn't a ninja attack. I think she's done some cross training.